For over 75 years, Central Atlanta Progress has played an integral part in helping the city not only find its identity, but become a modern standard-bearer for the New South. CAP continues to work behind the scenes to integrate ideas, build partnerships, and coordinate efforts to improve the center city, reaffirming the organization’s leadership role in the community and region. 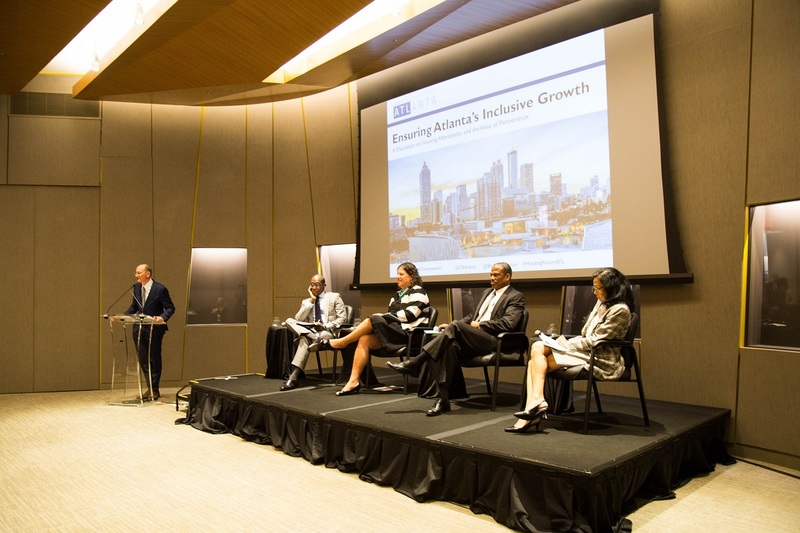 CAP is one of the major conveners of HouseATL, a cross-sector group of civic leaders committed to building the political and community will for a comprehensive and coordinated housing affordability action plan in the City of Atlanta. Participating partners have defined the problems, identified the barriers to success, taken a data-driven approach, and engaged in thoughtful problem-solving so that civic and business leadership in the City of Atlanta will have a shared, comprehensive set of policies and adequate funding to address housing affordability. CAP commissioned a series of research studies to understand the impact of a gaming attraction to the State of Georgia as well as local communities, with emphasis on urban cores. The research studies focused on four key areas, including state-level impacts of casino gaming, social and economic impacts to local host communities, as well as impact on real estate development surrounding a casino. View the full study here. Hosted by CAP and administered through Capacity Inc., Memorial Drive Atlanta works to make Memorial Drive a safer, more efficient, and more inviting connection for the communities of Southeast Atlanta. Memorial Drive Atlanta aims to realize its mission through four key focus areas: Movement, Development, Place, and Organization. Please visit memorialdriveatl.com to learn more. In 2013, CAP supported the creation of Sweet Auburn Works, an organization intended to implement preservation-based economic development efforts and preserve, revitalize, and promote the commercial and cultural legacy of the Sweet Auburn Historic District. Learn more about the organization at SweetAuburnWorks.com. Incubated by CAP, GeorgiaForward’s mission is to improve the state of Georgia by working as a catalyst to promote cross-sector, statewide conversations and partnerships by engaging young professionals and business, political, academic, and civic leaders. The organization’s signature programs are Young Gamechangers and the annual Forum. Learn more at GeorgiaForward.org. Learn more about our history of community leadership here.